You Can’t Buy THESE at the Grocery Store! 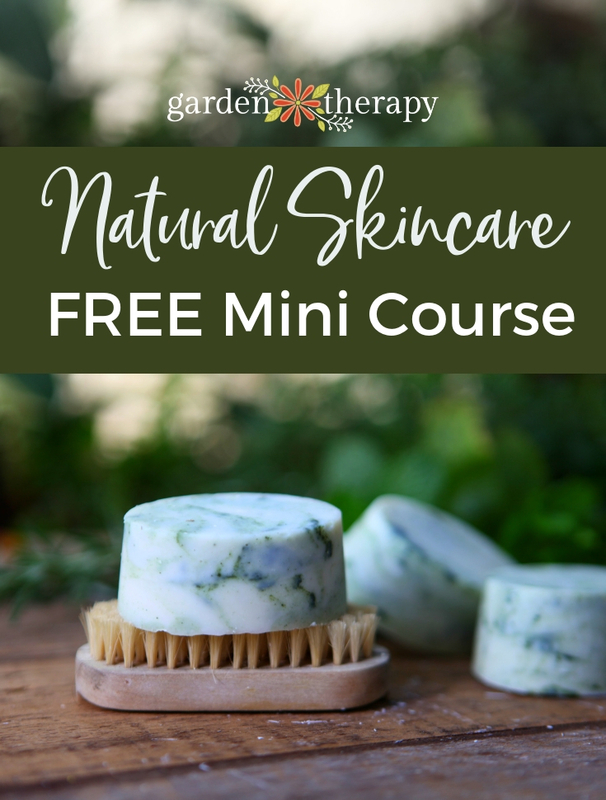 Learn about some unique edible fruit plants that grow well in the home garden, but are not often available in grocery store. 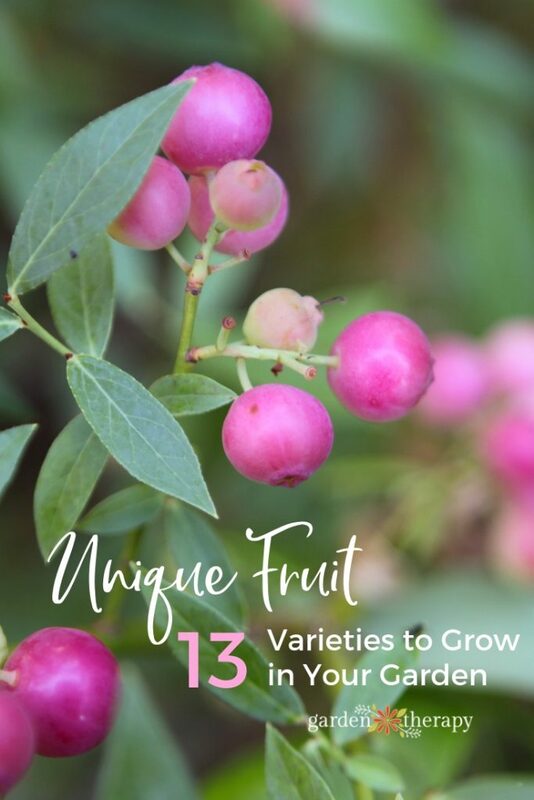 These seasonal sweet treats go beyond standard apples, oranges, and strawberries with unique colours, attractive plants, a variety of sizes, and out of this world flavour. Gardeners know good food because they grow it and taste it freshly harvested (don’t even get me started on the grocery store tomatoes and strawberries available in Vancouver in February!) When you give the plants love and attention for many weeks, months, or years, it’s worth that sweet reward of the freshest flavor that can’t be found at the grocery. 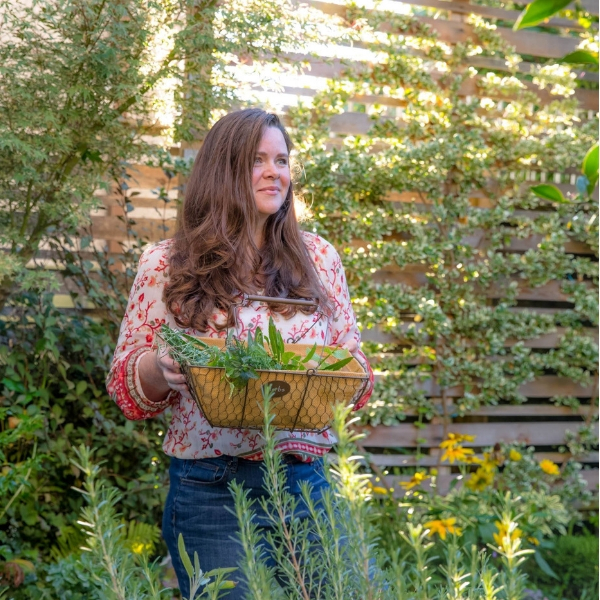 In my home garden, I generally look for unique edible plants to grow and purchase the standard fare items at the store or farmers market. I love to take guests on a taste tour of the garden, handing them unique edible fruit that can’t be bought. Most of all, these sweet treats are fun to grow for the aesthetics and flavours that will sweeten up any home garden. Here are a few examples of unique edible fruit plants that you need to grow at home, just to taste the sweet rarity of each bite. Ground cherries top this list of unique edible fruit plants because they have a special place in my garden because of how fun they are to harvest. Also known as golden berries or cape gooseberries, these tomato-family relatives grow in their own packaging. Paper lanterns grow on bushy 2’ plants that thrive in full sun. I love these in a children’s garden because when the ground cherries are ripe, the paper lantern will fall to the ground. Then, they can be collected from around the base of the plant with leisure, as they will stay unharmed until the paper starts to decompose, about 3 weeks after they fall. Kids can go on a ground cherry hunt and they love unwrapping the rich, golden cherries with a sweet pineapple-flavoured taste. Adults love them too, if they can get any! 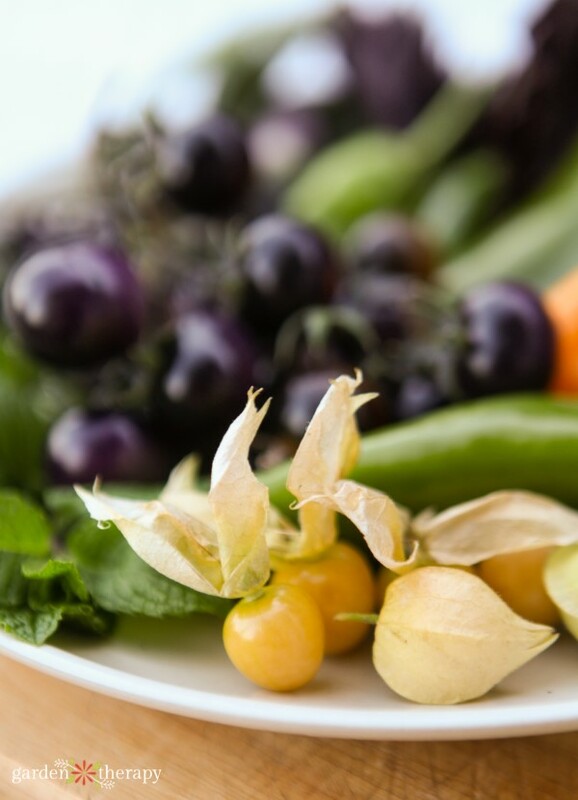 Here is a fun video on how to use ground cherries from my friend Nikki Jabbour! Blueberries are considered a superfood because of their anthocyanin pigment which is a dietary antioxidant. So why would anyone grow pink blueberries? I grow them for four reasons: the ornamental plants, the tart lemonade flavour, the later harvest time, and well, you can’t buy them in stores! Pink blueberries were developed by the USDA in the 1970’s but have only been available to home gardeners for about 10 years. They grow on attractive shrubs with silvery-green leaves that look much more decorative in the summer garden. They can tolerate more shade although they will produce fewer berries than in full sun. And the cedar waxwings that peck away at my blue blueberries get tricked into thinking the pinks ones are not yet ripe. Pink blueberries are fully pink when ripe. Just like blue blueberries, they can be sour if they have any white on them. I like them because the fruit are tart and sweet, reminiscent of their ‘Pink Lemonade’ moniker. Oregon grape is a native plant in my neck of the woods (British Columbia, Washington, Oregon), making it a very popular and easy woodland garden edible. The leaves are deep green and red, evergreen, and spiky like holly. The flowers are showy and yellow, and the fruit is ornamental in big clusters with a blue colour and a a dusty bloom. 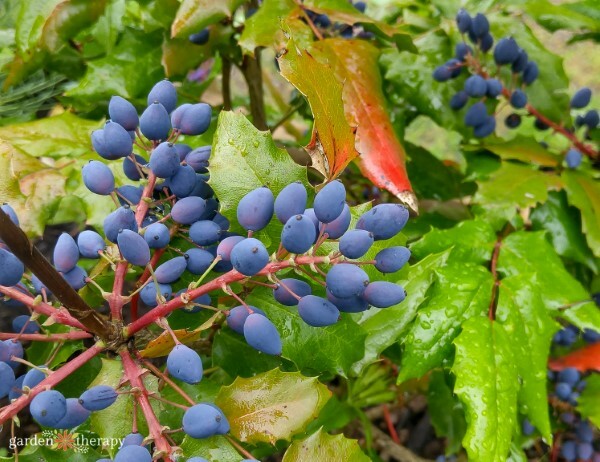 Oregon grape is often used as a medicinal plant (root) and dye (berries). The fruit are not grapes at all and are very, very sour. Very sour. Even so, they are worth growing and harvesting. Like other sour fruit, when you add some sugar, the flavours really come out. I often see Oregon grape jam and wine at the farmers market which has a grape / floral flavour that is intense and delightful. Here is my best tip for Oregon grape: harvest the berries wearing gloves so that you don’t stain your fingers! 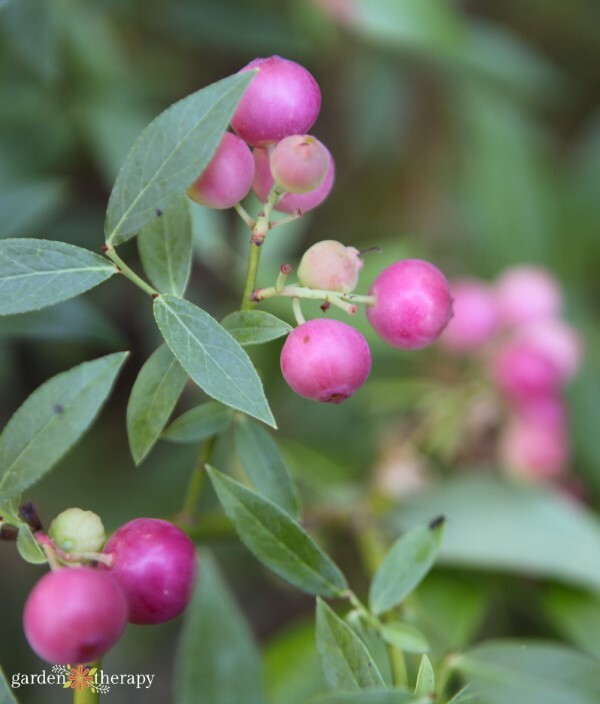 Another attractive berry plant that is native to the westcoast of North America is the red huckleberry. It’s a deciduous woodland shrub that does well in shade, and produces a large number of tiny red tart berries that are jam-packed with pectin. I often use these as a natural pectin source when making jam with multiple fruit. They are lovely for fresh eating and the tall, airy, tree-like plants look like delicate Japanese maples in shape, with much less decorative leaves. My mother-in-law tells me that they make a wonderful pie, but she was only able to harvest enough from her 13-ft tall shrub to make one pie ever. The tree produces enough for a few pies a year but as you can imagine, it can be quite the undertaking to get enough of the 6mm (1/4″) diameter fruit to make just one pie! I grow both yellow/white and red alpine strawberries which are sometimes called wild strawberries. Alpines strawberries pack all the sweet punch of a strawberry on a smaller, less bloated berry. Semi-evergreen plants grow berries all summer that are prized by chefs and foodies. The plants don’t have runners but the clumps are easily divided and they also easy to start from seed. 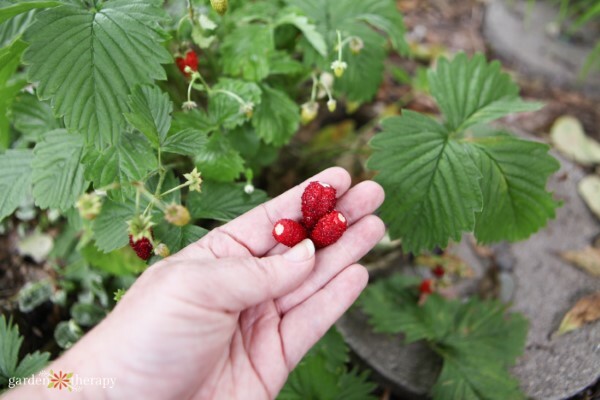 The berries really don’t store well, so they are best eaten straight from the garden or within a few days after harvest. You can certainly preserve them as well into jam, if you have any left. The flavour is exceptional, far better than any strawberry you’ve ever had! White alpine strawberries—which are more pale yellow when ripe—also taste divine with a hint of pineapple. The white berries can be a great way to increase the berries you get to eat vs. the berries that the birds get to eat. Similar to pink blueberries, white alpine strawberries resemble an unripe version of the traditional fruit. They have all of the flavor but a bit less visual pizzazz so they are a great choice for gardening with wild birds. Kiwi ‘Issai’ is a hardy perennial kiwi with exceptionally sweet fruit that are grape-sized, not fuzzy, and with an edible skin . This vine produces many virtually-hairless, super-sweet mini snacking kiwis. These hail from Siberia so you don’t need tropical temperatures. In fact, they are hardy down to -35º/-31ºF. This kiwi is self fertile, so you can grow it in a smaller garden where there is only room for one plant. 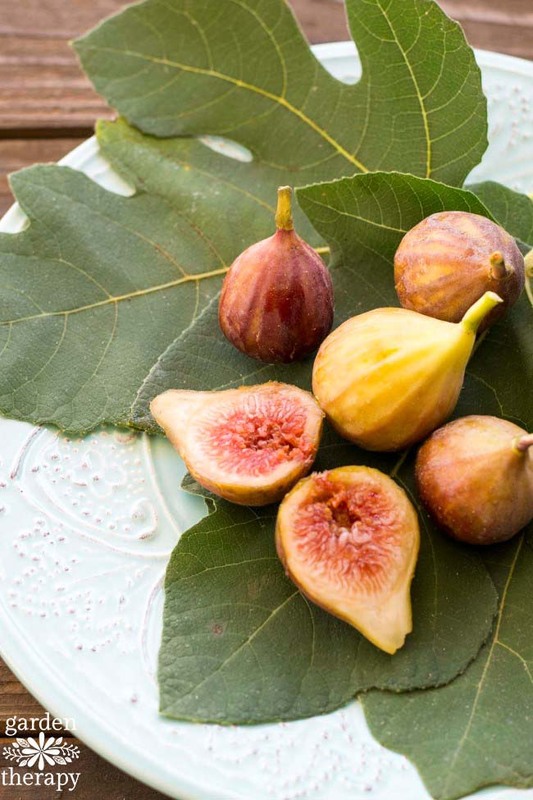 Fresh figs don’t transport well, so unless you have fig trees growing in your garden, you may only have access to Fig Newtons throughout the year. Dried figs are a great way to preserve a harvest that ripens all at the same time, but the flavor is nothing like a fresh fig. A ripe fig, warm from the sun, tastes like fruit soaked in honey with the texture of passion fruit dotted with tiny, crunchy seeds. Even if you have been lucky enough to try a fresh Black Mission, Brown Turkey, or other common variety when they are in season, there many more heirloom varieties in a range of size, taste, and color that must be tried. Read all about Growing Figs. 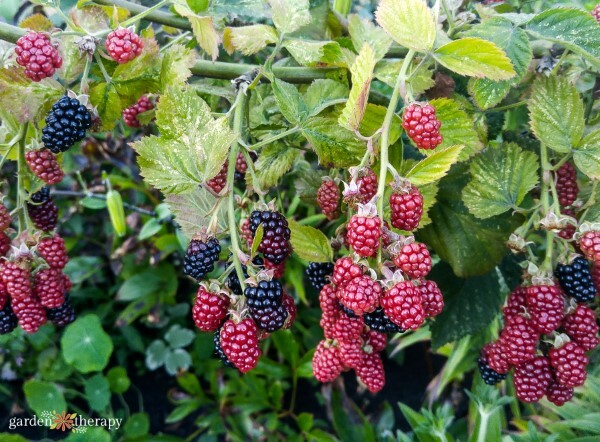 Tayberries are a cross between raspberries and blackberries with a sweet flavour when they are finally ripe (and quite sour when they look like they should be ready but aren’t). They ripen later than most blackberries and raspberries and need to be a bit squishy to not cause you to pucker up when eaten. They need a good tug to get them off the vine, so even though they are larger and (in my opinion) tastier than bath blackberries or raspberries, they can’t been machine harvested. This means commercial growers give them a pass and leave them for us home growers. 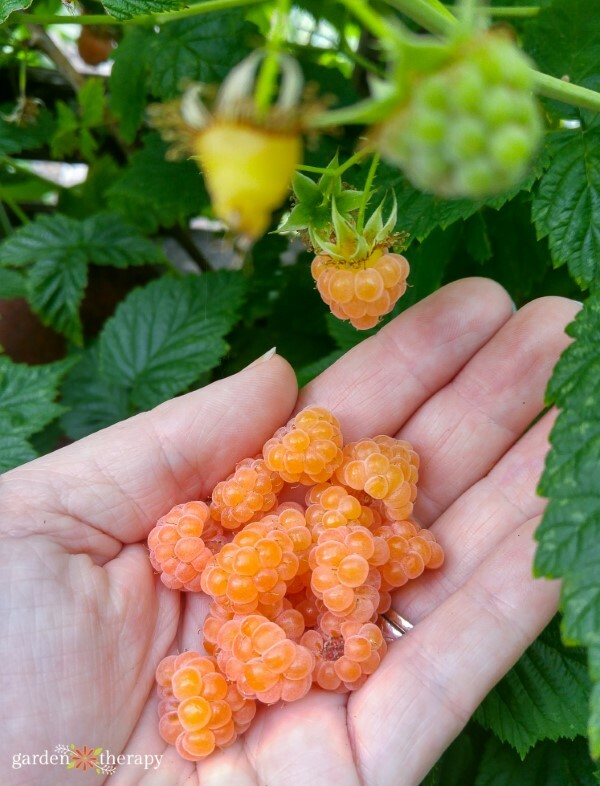 I grow golden raspberries in my garden that are everbearing but they seem to produce two bumper crops in the season: one in early summer just before the red raspberries and then again in the late summer/early fall. It not unusual for me to have fresh berries to pick in October. The flavour is similar to red raspberries but sweeter and milder with no tartness at all. Growing instructions are the same as red raspberry. They are delicious, Instagram-worthy, and you can’t get them at the grocery. Seaberries or Sea Buckthorns grow on unruly bushes that produce a mass of orange berries high in vitamins, oils, and antioxidants. The shrubs are large, wild, and heavy producers but they are especially wonderful nitrogen fixers in the garden that grow well in cool climates. These are prized in skin care recipes, plus they make a yummy juice or jelly. These are on my list to include in the garden this year so I’ll keep you updated with how they produce. Honeyberries are related to honeysuckle and the oblong, blue fruit taste like a blackberry-cherry-grape combination. Even though I haven’t grown these, I often see them for sale at my local garden center and they are on my list to try out one day when I have more space. Goumi berries are a nutritious, red fruit speckled with silver and gold on an attractive shrub prized for its dark-green foliage. The shrubs are easy to grow, and get quite large so make sure you have the space available. They certainly aren’t picky where they grow, and can thrive in just about any soil. They are hardy in cold climates as well so worth a look. The berries are pretty but they have a large seed in the middle like a cherry pit which makes them a bit harder to work with. The berries are quite sour and a bit bitter/chalky, but they do make a good pie or jam. They have been likened to sour cherries or rhubarb, but I think they taste like more sour red huckleberries. Speaking of unique edible fruit plants, what’s more unique than a fruit that changes how other foods taste? 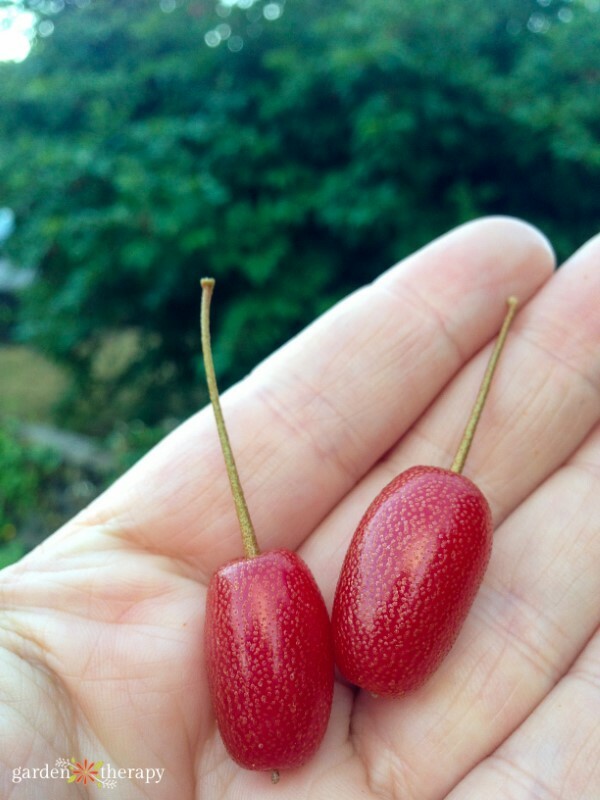 Miracle fruit is the berry from the tropical Synsepalum dulcificum shrub that miraculously changes the flavor of the things you eat afterwards. It’s a Zone 10 plant so in cool climates it must be grown indoors or in a heated greenhouse. The berries are small seeds covered by a thin, sweet covering that contains a glycoprotein called miraculin, which binds to the tongue’s taste buds when the fruit is consumed. Everything you eat for the next 30 minutes to 2 hours will taste much sweeter. Sour, bitter, and acidic foods like lemons, beer, and vinegar taste like candy, soda, and cookies. If it can make my kid eat broccoli, it might just be the most prized houseplant I ever grow! What unique fruit do you grow in your garden? Leave them in the comments as I would love to find some more! Hardy Kiwi is normally dioecious. Are you sure this one is self fertile? Thanks for the list of edible fruits to grow. I have planted close to 30 Kiwi Issai plants in front of an old cedar hedge that I have pruned back to the trunk on one side. It was getting to thick and encroaching on my vegetable garden. To hide the bare trunks, I decided to plant something that would bare fruit. The kiwis were planted 3 years ago and I haven’t eaten any fruit yet since only a few plants have produced any. The fruit that did grow never reached grape size. I live in Toronto so climate should not be an issue. They seem to be slow growers. How long do you think it will take for the plants to produce the large quantities of fruit they are supposed to have? I have a Saskatoon or Serviceberry bush. They look like blueberries but are more nutritious. Hi Teresa, they estimate 2-3 years to bear fruit so this will hopefully be your year! Your article would be much more useful if you gave the correct botanical names for all the fruits listed. Listing the USDA zones zones for heat and cold tolerance would also be useful. Interesting article. Hi Victoria, thanks for your feedback, although which botanical names are incorrect? They are all listed in the article and appear to be correct to me.